You are here: Home / Download your speech sounds chart here! Download your speech sounds chart here! 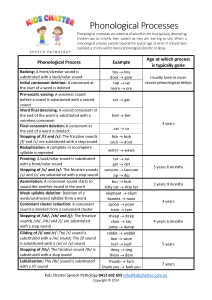 Here is a table outlining some of the common phonological processes (speech patterns) that children use when they are learning to talk. For some children, these speech errors may resolve by the expected ages, however when they don’t, it reduces their clarity of speech and therapy will be required to fix these errors. If these errors are not resolved by the time your child starts school, these errors may transfer to their literacy skills, making reading and spelling very difficult, so it is vital to get onto this early! Contact us if you have any questions about this chart or to book an appointment to have your child’s speech assessed. In the meantime, print out your chart and stick it on the fridge so you can keep tabs of your child’s speech patterns. Thank you for subscribing to Kids Chatter’s email list. From time to time, we’ll send you updates on all things speech pathology via our email newsletter.